Keating Law Offices is excited to remind you all that the 3rd Annual Chicago Bike Swap event is going down this Saturday, March 9th at the UIC Physical Education Building. Not only has the venue moved to a larger location, but the steady momentum and growth with each successive event has garnered the attention of local media. Shopping for bicycles or some bike parts for that spring bike build? Come on out and enjoy the daylong event this weekend. 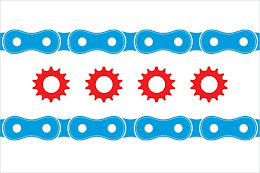 We'll have a table set up handing out free gear including Chicago Bike Flag t-shirts, patches and stickers. Illinois Bicycle Lawyer Mike Keating will also be participating in an expert panel to educate the public of their rights if involved in a cycling-related crash. The legal panel will start at 2:15 p.m. The Bike Swap will run from 10am to 5pm in the UIC Physical Education Building: 901 W. Roosevelt Road. For more information on the presentations and demonstrations planned for the day, check out the Chicago Bike Swap website! And don't forget to stop by our table and say hi!